About four years ago (has it really been four years?) I wrote a post about a possible ancient Filipino text concerning a visit of Christ to the Philippines. I had heard of this text from one of the missionaries I served with. At the time I wrote that post I didn’t think I would write about this subject again until I had that text in hand. However, I recently discovered another, or the same, text online. It seems there is a movement in the Philippines centered around a text entitled, “Ang Aklatan.” This title is Tagalog for “the library.” It seems that this Ang Aklatan is a record of Christ visiting the Philippines and God’s work there. I’m not sure if this is the same text the I heard about on my mission or not. In this post I will be introducing you to the Aklatan. 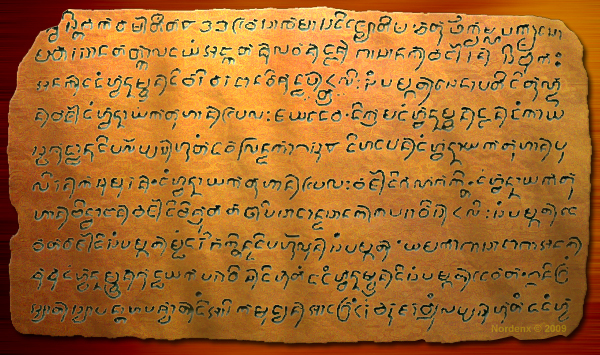 In 1986 a Filipino man named Elisha Enoc had a vision of copper plates hidden in a cave. Later he had an encounter with an American man named Oleeha. This man was to help Elisha in translating the copper plates he had seen in the vision. The next year in 1987 Oleeha returned and brought the copper plates with him. He showed Elisha how to translate, and they spent hours translating the text. But when Elisha woke up he realized it was all a dream. He then wrote down the translation that had occurred in his dream. This method of translating continued for eight months. After it was completed Oleeha told him that he needed to wait twenty years before publishing the text. This seems very specific and is more about rebuilding Filipino culture and bringing them to Christ rather than a gospel message for the whole world. The Aklatan is as its name suggests, a library. It is a collection of books and other texts compiled into one book. It is important to note that not all of the book in the Aklatan have been published. It seems that initially only specific portions of the text were published. The rest are being held back until certain goals are reached in the movement to establish the kingdom. The Book of Visions – This book was written by Elisha. It is basically a journal of the events the led up to the translation of the Aklatan. Selections from Ezekiel – This is a portion of the Bible copied and inserted into the Aklatan. This was done at the command of Christ in the Book of Visions. The portion of the Bible that was copied is Ezekiel’s vision of the third temple. The Life of Suran – This book is a summary of the life of a prophet Suran. It also contains the history of how God’s people was reestablish among the ancient Filipino people. This book also contains some prophecies of Suran. The Great Scroll of Suran – This book has not been published. Based on clues in the published text this book is probably the source of the Life of Suran summary. It may be the complete record written by Suran. The History of the Ophir – This book has not yet been published. The Journeys of Gubir and Jaresh – Jaresh, one of Arakim’s sons; and Gubir, a prophesied person from the Book of Ahkman; travel to preach the word of God. The Book of Kimesh – This book has not yet been published. The Gospel Written by Angulu – This is an account of Angulu who would later be appointed by Christ. In the beginning of this book he married a woman. Then they travelled to a place were other of God’s people are gathered. He speaks to a man named Bodan. Bodan recounts traveling for many years to Bethlehem and seeing Christ as a child. Through Bodan’s account, Mary(as in the mother of Jesus) tells the story of Christ’s conception and birth. The end of this book has several sayings of Christ. The Gospel Written by Taletan – This book has not yet been published. The Lesser Gospel Written by Buka – This book starts with great destruction and darkness similar to the Book of Mormon account. The believers in Christ are gathered. Other people think the destruction came because of the believers so they start to hunt them down and kill them. Some people rose up to defend the believers. Later, Christ comes and he preaches among the people. His lessons are pretty much the same as in the Bible and Book of Mormon. Christ appoints twelve of the warriors that defended the people to be his disciples. He later travels with the disciples around the land and preaches his Gospel. Christ also appoints twelve women to preach His Gospel as well. A Record of the Twelve Women – This book has not yet been published. Prophecy of the Prophetess Liwan – One of the twelve women Christ appointed prophesies about twelve women who will come in the future and help to establish the kingdom. 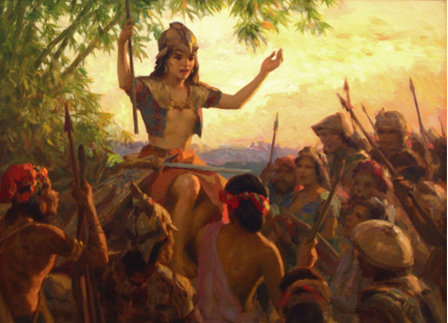 The Book of the Strangers – A group of people from the pacific ocean arrive in the Philippines. They join with the followers of Christ. The Prophecies of Telemek – This book has not yet been published. The Song of Banali – A poem(song) about God. The Book of Datara – This book has not yet been published. The Book of Kilinga – This book has not yet been published. The Preserved Record of Algapo – This book has not yet been published. The Book of Namwaran – Not all of this book has been published yet. With the numbers of the believers in Christ decreasing Namwaran goes to help defend them. He teaches his nephew, Ruman, in the ways of Christ. The chief of the land wants to reward Namwaran for his service so one of the chief’s advisers offers his daughter. Namwaran eventually marries her. Toward the end of this book he begins to gather the records of the believers. The Book of Ruman – Ruman begins writing the book that was prophesied would go to future generations. 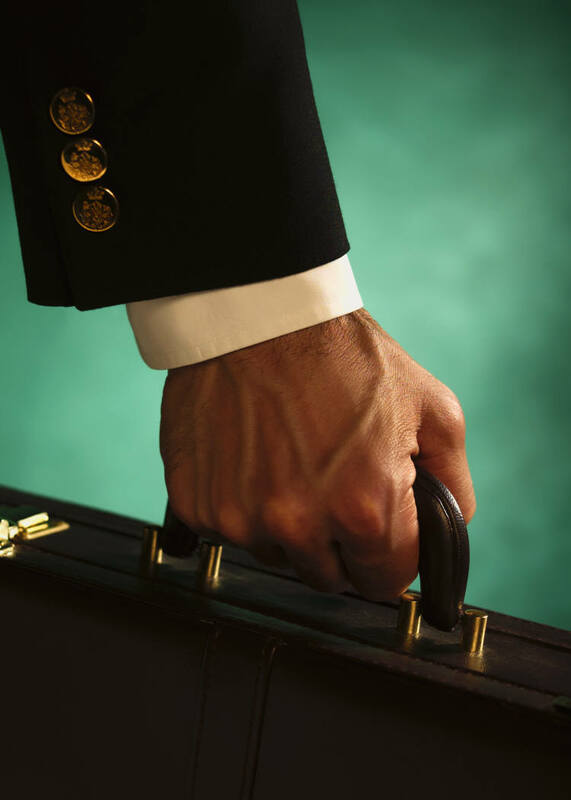 It seems similar to the Book of Mormon, in that he complies the records that were gathered. He writes this record on copper plates. John(the one who did not taste death) visits Ruman. He explains his vision that is contained in the Book of Revelation. Paul then appears and accepts Ruman’s words as his own. The Rock of Ruman – In another vision Elisha sees a rock that has some writings of Ruman engraved on it. In it Ruman prophesies about the coming forth of te Aklatan. The Record of the Ancients – This book has not yet been published. Now, this is just my summary of these books. I highly suggest you visit their website where you can read them for yourself. If you’re a book lover like me, they offer a hardcopy of the Aklatan for sale. For me it speaks volumes as to the sincerity of someone who offers their work for free at the same time they are selling it. One of the best analysis of the Aklatan is the one on going on the blog hiddentolight.blogspot.com. The proprietor of that blog actually goes through and does a chapter by chapter analysis of the Aklatan. Only the first part of the Life of Suran has been wriiten about so it is still a work in progress. This can be found at the 5:39 mark on part 4 of the Hans Mattsson Mormon Stories podcast. The similarity of these claims stood out to me. I suppose this may gives some veracity to the newmormonscripture blog entry. Having two Church leaders mention this mysterious book seems more than coincidence. But, I’ll leave it up to you to decide for yourself. That blog is a bit too TBM for me. Finally, I was surprised to find that there is a FAIR article about the Aklatan. It is under the title Forgeries Related to the Book of Mormon. This page basically says that there is a high degree of correlation between Christ’s words in the Book of Mormon and in the Aklatan. They interpret this mean that the Aklatan is a modern fake. The issue though I have with FAIR’s article is that if the shoe was on the other foot, and the Aklatan had come from Church leadership; they would work just as hard to prove it is correct. They would probably say that the high degree of correlation between the texts is evidence of its divinity. The Aklatan seems to answer a lot of modern questions about marriage, homosexuality and the like. This could be evidence that it is a modern fake. It could also be evidence that it was divinely inspired for the text to come out now, when we need these answers. I have to say that I love the Gospel Written by Angulu. If it is not historic, it is still an awesome story. If it is historic it is an amazing look into the past. The main part of this book is an account of Bodan who was one of the wise men who visited Christ. Apparently some people from the Philippines left, and went west. 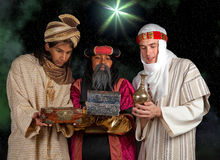 They met up with other groups at they traveled to Bethlehem. There in Bethlehem they met Mary. After giving gifts to the child they ask Mary about the the birth of Christ and Mary tells them the story. This a fascinating account. Where else do we have an account of the birth of Christ from the mother of Christ herself? There is such a strong female presence in this book. It really shows the power of women and their importance. I can only imagine what is contained in the Record of the Twelve Women. If this text is genuine it would support Joseph Smith’s creation of the Relief Society as a Priestesshood. The feminist crowd would have a field day with this book. I also like the description of the temple in the Book of Ahkman. I just love imagining structures described in ancient text. I guess it just fuels my imagination. Lastly, what really intrigues me is the Book of Namwaran. In 1989 a strange artifact was discovered in the Philippines. It is called the Laguna Copperplate Inscription. It is kingly proclamation absolving a man named Namwaran and his descendents of a debt. This was found two years after the Aklatan was translated and supports, at least, one part of the Aklatan. If it doesn’t come from the prophet, then it’s not scripture. From what I’ve read this seems to be a very common objection. However, I have never heard any president of the church declare that all scripture must come from him. Rather we find that new scripture is approved through common consent. This verse doesn’t say by the voice of my Church leaders. No, it says by the voice of my servants. Certainly a Church leader can qualify as one of the Lord’s servants. But to be a servant of the Lord doesn’t require one to hold a leadership position. If the Lord called this man Elisha to perform a work, then he would be considered is one of the Lord’s servants. A person can only receive revelation within the bounds of his or her respective stewardship. I think this is in clear support of the principles of stewardship. Elisha hasn’t claimed to be a prophet for the whole world. Nor has he tried to start his own church. It is clear from Elisha’s statements, and the text of the Aklatan, that this work is limited in scope, to a specific area. I don’t see the Aklatan violating this edict. Elisha doesn’t have authority to do this. Chapter 4 of the Book of Visions gives an interesting account. Here Elisha is baptized and is given priesthood authority. This is all fine and well as anyone can CLAIM baptism or CLAIM to have received priesthood authority. But is it really valid? I believe the key lies in figuring out who gave him these things. – There were three of them. – They were taller than Elisha, a Filipino man. – They could not tell him their names. – The had been sent by God. This verse is Mormon writing about the three Nephites. I know for many this may seem outlandish. 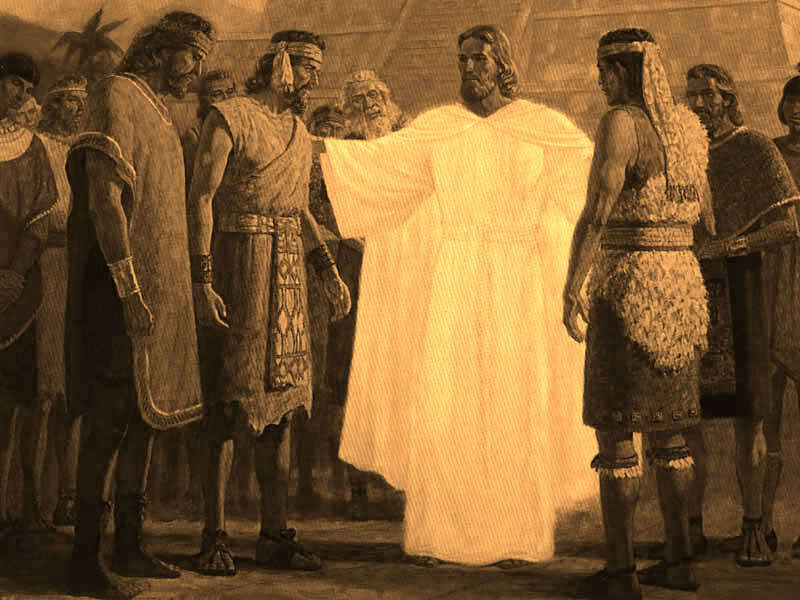 However, I ask you, if it was the three Nephites that baptized and ordained Elisha, wouldn’t his baptism and ordination be valid? Joseph Smith never used a pseudonym, and neither has any other prophet. Why should this guy? Actually Joseph Smith did use pseudonyms. Many of the revelations in the Doctrine and Covenants originally used these pseudonyms rather than the given names of people. These pseudonyms have since been replaced with given names in the modern publications of the Doctrine and Covenants. The Philippines holds a special place in my heart. I think it will be really interesting to see if the Aklatan can accomplish its purpose. The book itself is fascinating and well worth the read. It gives answers to some questions I’ve had, but also brings up many more questions. Is the Aklatan a genuine text from God? I’m still on the fence as this point. The more I search the more I find texts that are show God’s hand in all the world. I suppose I will do with the Aklatan what I do with anything else I come across. I’ll take the good that I find and leave the rest. This entry was posted in Prophets, Scriptures and tagged Aklatan, Book, copper, Elisha, Filipino, Mormon, Philippines, prophet, Record, scripture, translated. Bookmark the permalink. Very interesting article, and a very strange topic for most of us. I’m not feeling particularly prompted to accept the Aklatan as scripture, but it is interesting that the purpose of the book and of the calling of Elisha Enoc seem to be specifically limited to the Philippine people and surrounding islands. Perhaps this book is more relevant to you because it is directed to your family. I am most skeptical about the church being institutionally connected to this. I would expect the church to excommunicate everyone involved. And I’m not saying that because I think this is any indication that the Aklatan is wrong, just that I would expect ANY true prophet to be excommunicated by the church. If Joseph Smith was still around you can be sure he would be excommunicated, so why not this guy if he is indeed a true prophet? Fascinating. Never would have heard of it. Love the 3 Nephite correlation. Thanks for taking the time to share. Brother Ellis, this book you wrote about promotes ideas that go against what is taught in the Bible, even having women be called to teach men. This is also my question on this book! Samuel and Elmer, are either of you Mormon? On the other hand, are you Biblical inerrantists? Hello, after reading this amazing piece of writing i am also delighted to share my know-how here with colleagues. As an RM who served in the Philippines several years ago, this intrigues me. I don’t have time to read the book itself at the moment, but it’s definitely going on my “to read” list. I won’t lie, I hope it’s true. I stumbled upon Ang Aklatan about a year ago and have been analyzing off and on since then. While I’m hesitant to state a conclusion this early in the game, I find it interesting that what limited web presence it has is either bloggers who mostly give it the benefit of the doubt and FARMS’ outright classification of the document as a forgery. I’d be willing to collaborate with you and other bloggers to help put together something like a guide for Ang Aklatan that correlates it with the LDS canon (both where it disagrees and agrees) with historical/cultural notes and other questions related to the text. Honestly, I’ve decided to suspend judgement on the whole thing until I can learn more about it and once I can see how the movement surrounding it progresses, so a sort of Lorenzo Snow-style approach. Let me know if you’d like to get together on this and I’ll see what I can do. Is there any updates about the group of people who believes in this book? Its been a years since they updated. It looks like they vanish completely. But my hope is continue, seeking to know about that book. I emailed you, Jay, but I thought I’d post here, too. I don’t really have much to update. I’ve been following the Aklatan and its group for over 4 yrs, but they haven’t updated anything on any of their sites for a long while now. I do know there were a few people from this side of the Pacific who went over to see if they could find anything. They came up empty but did end up starting a small hospice there.